The nationwide movement to exempt their pensions from state taxes doesn’t add up. Making military pensions exempt from state taxes is a bad idea. There are the constant standing ovations at sports stadiums. There is the jump-to-the-front-of-the-line privileges at Amtrak and airline ticket counters. There is federal legislation to incentivize employers to hire veterans and White House pressure on federal agencies to do so. And now comes another, increasingly prevalent way to show appreciation for those who’ve served in the military: exempting them from taxes. A growing number of states have moved to, or are considering, exempting military pensions from state income taxes. As the Wall Street Journal reported on Thursday, no fewer than 19 states are now considering legislation to create or expand tax breaks for veterans, with 65 bills toward that end pending in state houses. Last year, Iowa passed a full exemption and Nebraska enacted a partial one. Already, nearly half of all states don’t tax military pensions at all (this includes the seven states that don’t tax personal income, period), and 20 more states partially exempt them; there are only seven states left with no exemption for veterans. And with nearly 2 million Americans collecting military pensions, the exemptions come at a substantial cost to state coffers: In Maryland, a proposal by Republican Gov. Larry Hogan to exempt the 50,000 military pensions in the state from income taxes would cost the state $34 million in revenue and local governments $22 million, at a time when both are already facing a fiscal crunch. Proponents of the exemptions cite two different arguments on their behalf—without reckoning with the fact that the two arguments are contradictory. The first is the emotional argument made on behalf of other preferential policies for veterans, like hiring incentives for employers: We owe special treatment to those who have served the country in uniform and put themselves in harm’s way, especially because so many veterans have difficulty adjusting to civilian life. “This tax cut is the first step, among many to come, to ensuring that the people who spend their lives in service to others are given the support and tax relief they deserve,” said Hogan in announcing his proposal for Maryland. The second is the economic argument made for other state tax breaks: Veterans are job-creators and productivity engines who will boost the business climate and bottom line of whatever state they live in. Indeed, many military retirees are not grizzled vets telling war stories on the porch, but relatively young men and women with thriving second careers. One can retire and collect a military pension after 20 years of service, so there are plenty of 42-year-old “retirees” who are collecting pensions of, say, $50,000 per year while making a good living as military contractors or management consultants, two common second-career destinations. States would like to attract these high earners, if not to tax their income than to have them spending their earnings—both military and private sector, plus their government benefits for health care and higher education—within their borders. In effect, the case for pension exemptions takes two big drivers of government policy—the “help veterans” motivator and the “attract job-creators” one—and fuses them together. But proponents can’t have it both ways. Either military retirees are a group that needs an extra boost, or they are a privileged class that, by virtue of the skills they’ve acquired in their military careers, are economic winners that a state wants to have for itself just as it wants the next Google server farm. Not to mention that the arguments each fail on their own, as well. If we are genuinely trying to help needy veterans, we shouldn’t focus on the retired officers of advanced rank who put in the full 20 years to collect a pension, but rather the men and women of lower rank who left the military before earning this generous retirement benefit. By the military brass’s own admission, its current pension system is skewed sharply in favor of those who retire after more than 20 years, leaving little for those who put themselves in harm’s way but left earlier. And if a state is trying to attract military retirees for economic reasons, there is little evidence that exempting pensions from taxes serves as a major lure. The Journal cited a finding by legislative researchers in Minnesota showing that the state’s military retiree population hadn’t changed much, proportionally, compared with Wisconsin, which has fully exempted military pensions since 2001. 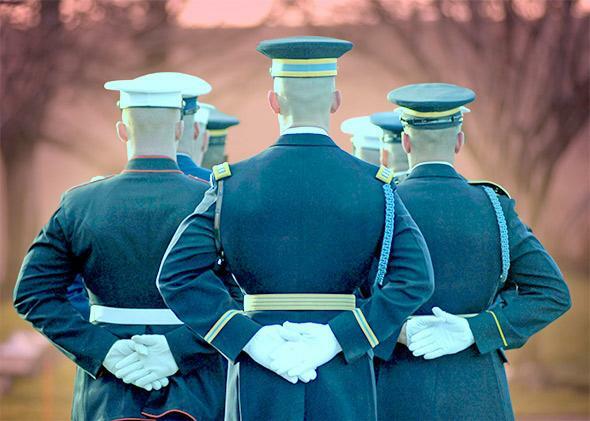 After all, younger military retirees who are looking for a second career will likely base their decision on where to live more on where they can find a good job than on whether they save a couple thousand dollars in taxes. (For retirees who are truly retired, the tax math may matter more.) Chasing second-career military retirees with tax breaks may be just another version of the costly race-to-the-bottom that tax incentives for big employers have become.